For two seasons, Little Big Shots has performed well on NBC, so now the network is introducing a senior citizen-centric spin-off, its new Little Big Shots: Forever Young TV show. Can the Peacock Network repeat the magic? Will Little Big Shots: Forever Young be cancelled or renewed for season two? Stay tuned. 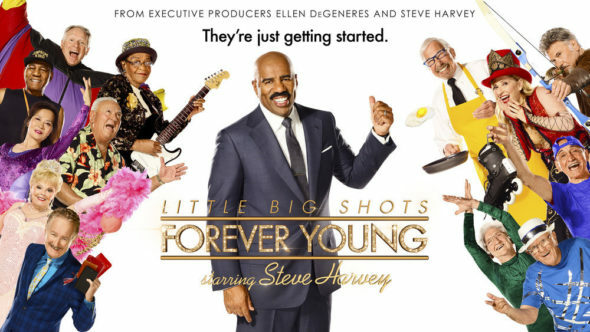 An NBC comedy variety series from Ellen DeGeneres and Steve Harvey, Little Big Shots: Forever Young showcases young-at-heart seniors with hidden talents, sparkling personalities, and the wisdom only born of experience. As host, Harvey interviews musicians, singers, dancers, and other talented senior citizens between ages 60 and 103 years old, who also perform on the series. Some are athletic, some are particularly notable in their fields, some are dancers, singers, musicians, magicians, or social media sensations. All of them, though, are forever young. 7/27 update: You can see the rest of the latest night’s ratings. For comparisons: The first season of Little Big Shots averaged a 2.09 rating in the 18-49 demographic and 11.51 million total viewers (live + same day ratings). What do you think? Do you like the Little Big Shots: Forever Young TV series? Should it be cancelled or renewed for a second season by NBC? Why is the focus on viewers 18-49? I’m 59, and I have spending money, so advertisers need to wise up and ask what people my age want to watch! I love this show, as well as Little Big Shots. Please bring it back for another season.